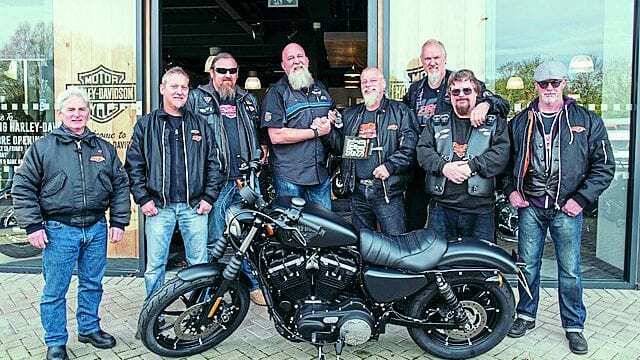 West London Harley Riders are celebrating their 35th anniversary this year, and they’ve decided to do something a bit different. 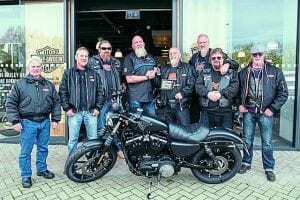 The photo shows club members at Reading H-D, picking up the 2016 883 Sportster Iron which they’ve bought to use as a raffle prize. It has 1,800 miles on the clock and comes with one year’s warranty. They’ll be raffling it off at their annual Burning Budgie Rally, which is held over the weekend of 27-29th July, and the winning ticket’ll be drawn on the afternoon of Saturday, 28th July. All profits will be split 50/50, with half going to the Motorcycle Action Group (MAG) and half going to the Headway Association, North West London. Tickets are £5 each and can be bought from club members – get more info from their website at www.westlondonharleyriders.co.uk and Facebook page.